For once, Bell is being truthful; BetOnline (BOL) posted a line shortly after the Spurs defeated the Thunder in Game 6, before anyone else. The problem is that the lines BOL posts before anyone else are essentially meaningless, and divorced from the actual market. Here's what happens. BOL posts a line as soon as possible, in no small part because they know they'll get some free PR when people who are desperate for attention tweet about it. 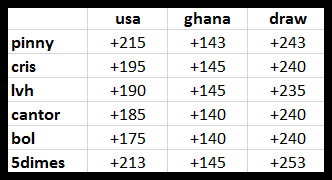 This initial market will have a low limit (often $250), such that if a serious bettor had an opinion on the line, he would wait for other shops with higher limits to post their lines so he could get more than $250 down. It's difficult to put into words just how non-noteworthy that move is. Wow! 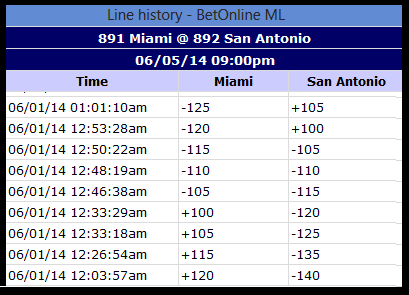 Tons of sharp money must have come in on Miami! Earlier, Bell was tweeting about the BOL line moving five cents like it was breaking news. Now they're moving 10 cents on air just to get their line somewhere near CRIS' opener. 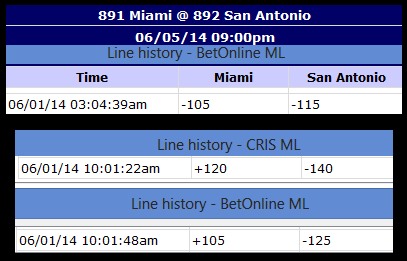 Maybe those bets driving the Heat up to -125 weren't so sharp after all? Moving 16 cents on air to get in line with the real market. Standard. The BOL "World Openers" market is nonsense. The line is initially posted by some BOL employee who has an established track record of not being very good at this. 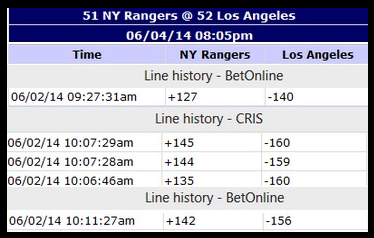 It's bet into by people who are content betting $250 at a time. And then other books post lines, completely ignoring BOL, and BOL moves their line toward the sharper shops' price, because that is the actual market. But in Bell's world, none of that matters. He often makes it very clear that maximizing his exposure is the only thing he has any interest in. 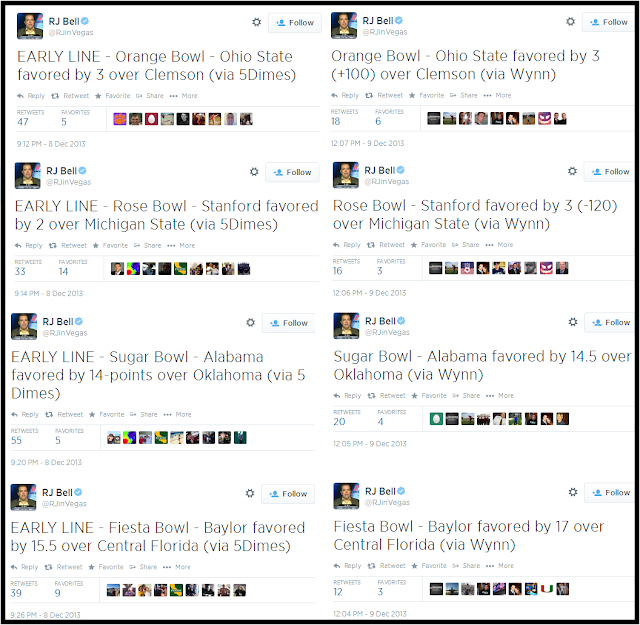 Why else would you possibly dedicate eight separate tweets to BCS lines over a three hour period? He conveniently doesn't mention the juice or the max for the 5Dimes lines, possibly because they were dealing 40 cent lines with a $500 limit. But more importantly, that sequence of tweets combined for 240 RTs. Success! This isn't a matter of a small discrepancy from one book to another. The market was very clearly implying one thing, and Bell reported something not even close to that. 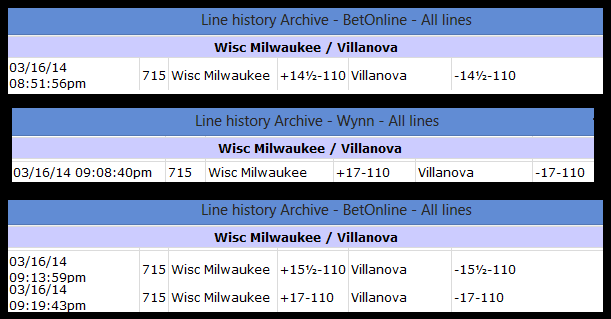 Apparently Bovada -- a fantastically square US-facing book which would clearly shade their line to give homer USMNT bettors an inferior price -- was dealing +160/+160/+250 around this time. It'd be bad enough if Bell referenced Bovada in his tweet, but he doesn't even do that, instead acting as though the odds he reports are somehow an accurate representation of the overall market. Simply reporting facts just shouldn't be that hard. If you were making a legitimate effort, that is. 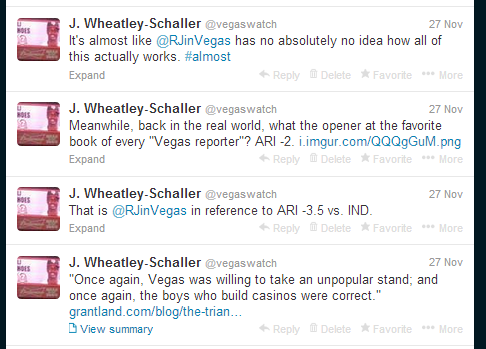 But R.J. is such a fraud that he can't even reach that relatively low bar. When you're so eager to please and so obsessed with people retweeting you (as often as possible), when you have no clue how these markets actually work, and then on top of that you're so loose with the facts themselves...even if you WERE reporting something which was pertinent and interesting, why would anyone believe you? The man simply cannot be trusted. With anything. I'm not sure how may times this is going to have to be demonstrated for people to stop acting like he's a legitimate source of information or "analysis", but I'm willing to find out. 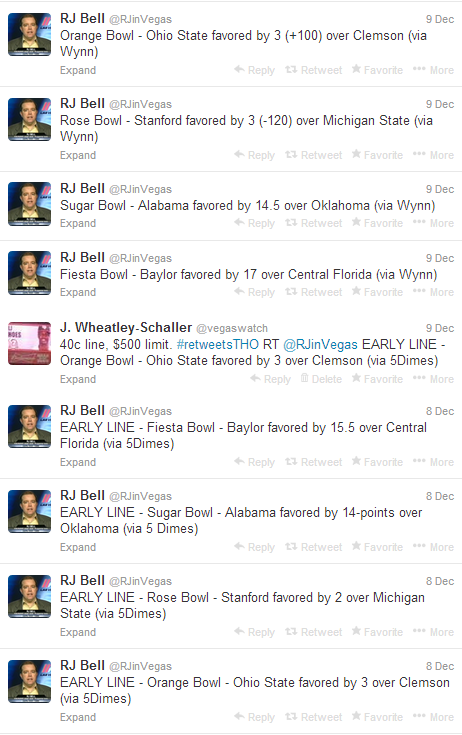 Previous Long Con post: "Transparency"
Quite possibly the worst part of all this are all the people who don't know any better that call him "oddsmaker/bookmaker RJ Bell". This is obviously a problem because the more uneducated people say it, they unintentionally give him more undeserved credibility. http://baltimore.cbslocal.com/2013/05/23/not-everyone-sold-on-the-ravens/ - "I got an email from a Vegas bookmaker named RJ Bell. He sent me the latest odds on the Ravens, and I was “un”pleasantly surprised. He had the Ravens as his 17th choice to win the Super Bowl at 50:1." 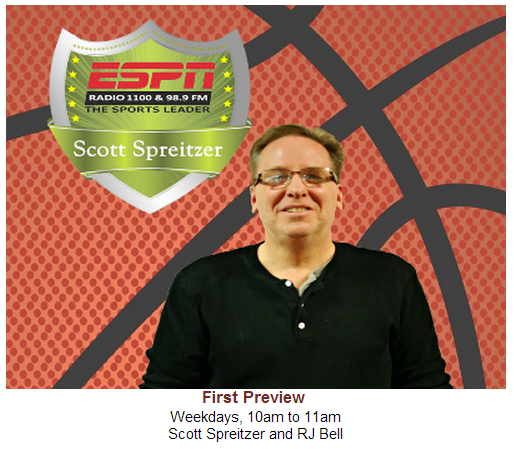 RJ Bell, one of worlds top oddsmaker joins us on The Bush Leagues next. Where's the smart money going and will Beyonce pull a Janet? #YEESSS"
"Randall James Busack (known professionally as RJ Bell) is the founder of Pregame.com, the largest legal sports betting news website. A modern day “Jimmy The Greek,” Bell has become the preeminent oddsmaker for sports and pop-culture events."